Usually, after Friday night hockey, we go for eats that are located centrally and appeal to most people. Yes, I normally appease everyone, hence, the eats are sometimes less-than-stellar. However, I was going to be selfish this time around. It was my birthday and I was going to exploit it. So there after the game, it was suggested we eat somewhere near. But no. I played the "it's-my-birthday" card and put my foot down. We were going Downtown to eat and I wouldn't take no as an answer. Well, if no one agreed to go, I guess that would've backfired! Fortunately, my friends would never do that to me (or at least I hope not) and joined me for some late night eats at Cardero's. The last of the Sequoia Group restaurants that I have yet to blog about, Cardero's is situated right on the waterfront in Coal Harbour. Considering its location and "class" of restaurant, the prices are surprisingly reasonable. Gadget Girl and Emilicious ordered some healthier items, but that only made me guilty as to what I chose to eat (more on that later). 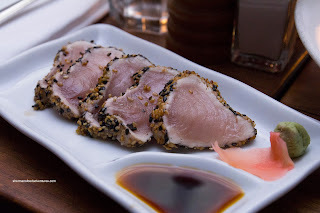 They started with the BC Albacore Tuna crusted with sesame served with soy and wasabi. This was a pretty straightforward dish with the tuna being rare in the middle. Nothing amiss with the tuna and the black/white sesame added some good aromatics. 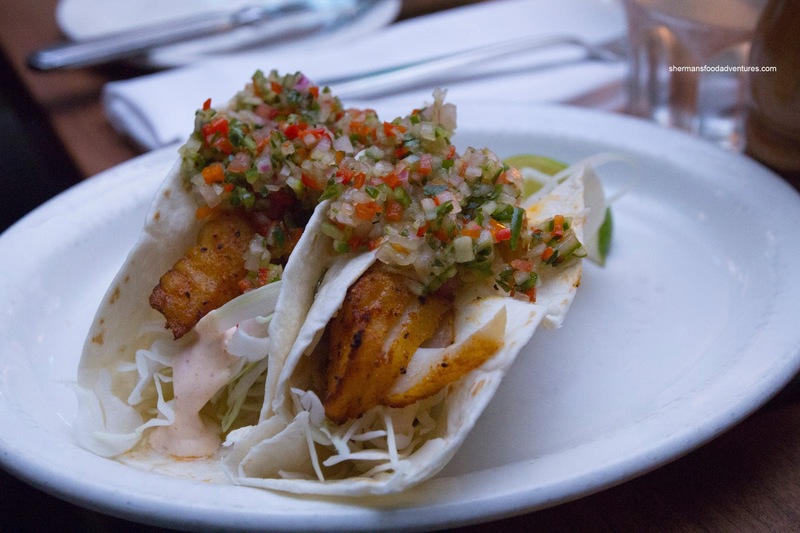 They also had the Westcoast Fish Tacos with salsa fresca and chipotle served in white corn tortillas. With the amount of moisture in the taco, the tortillas became rather wet on the bottom, yet didn't break apart. They felt the moist fish was mostly lost with the amount of cabbage and salsa. 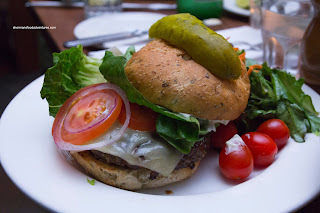 Milhouse went for his usual being a burger, specifically the Coal Harbour Burger with aged white cheddar. He tried to make the meal healthier by choosing salad instead of fries. He thought the burger was moist and meaty while being a bit mild in flavour. He liked the bun as it wasn't dense, yet ultimately, the bottom bun got quite moist. 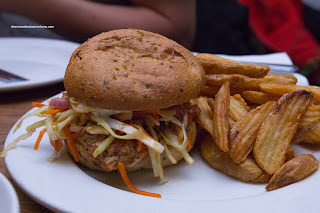 Lionel Hutz opted for the Cajun Chicken Burger with bourbon BBQ sauce and coleslaw. Although the chicken was moist, he felt there wasn't enough of it and/or it was overwhelmed by the coleslaw which had raw onion (which he didn't prefer because it was too strong of a taste). Furthermore, the bourbon was not very impactful. The fries were good though being crispy and potatoey on the inside. Now, for myself, I ended up sharing 3 mains with Gordo. Yes, we are gluttons and aren't afraid to show it! First, we had the Duck Confit Pizza with arugula. The thin crust was crispy and light with a proper amount of seasoning. 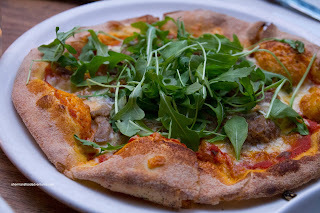 There was also a decent amount of moist duck confit, but it was mostly in the centre of the pizza which meant after the first few bites, there was no more duck. We felt the pizza was missing something as it was bordering on flavourless. Maybe some Parm or salt would've helped? The pizza was one of their featured items of the day and the next 2 were as well. Arriving looking more like soup than pasta, the Smoked Salmon Fettuccine was also lacking in flavour. What it wasn't lacking was ingredients. There was a good amount of moist smoked salmon as well as sweet peas. 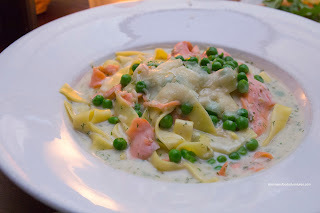 The lemon dill cream sauce didn't have much oomph as the only flavour I could pick out was dill. At least the pasta was al dente (yet started to get soft with all the sauce). 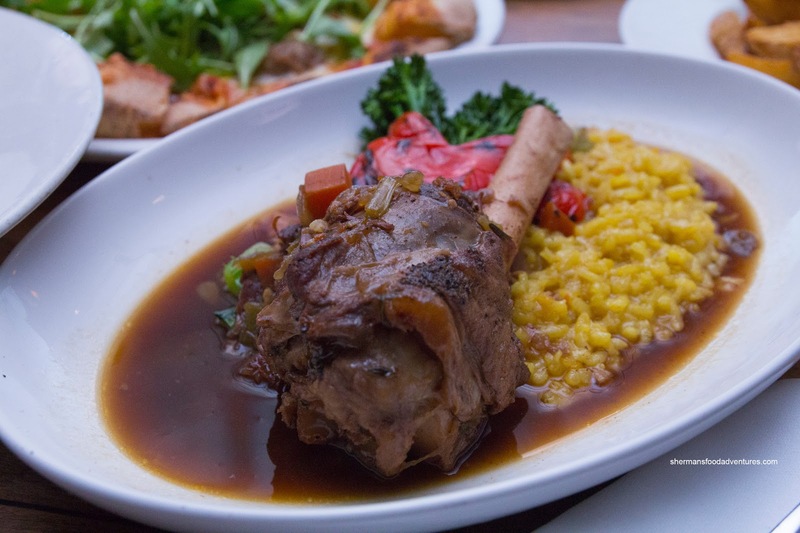 Lastly, we had the Lamb Shank with lemon saffron rice and vegetables (broccolini, carrots and red pepper). Decently-sized and properly prepared, the lamb shank was tender, moist and "lamby". Although I enjoyed the mild and silky sauce, there was a bit too much of it, which essentially drowned the rice. With that being said, the rice was good though, not being overcooked and I did get the hint of saffron. As you can already guess, the food was decent, yet could be refined in each dish. That's not to say we didn't enjoy our visit. 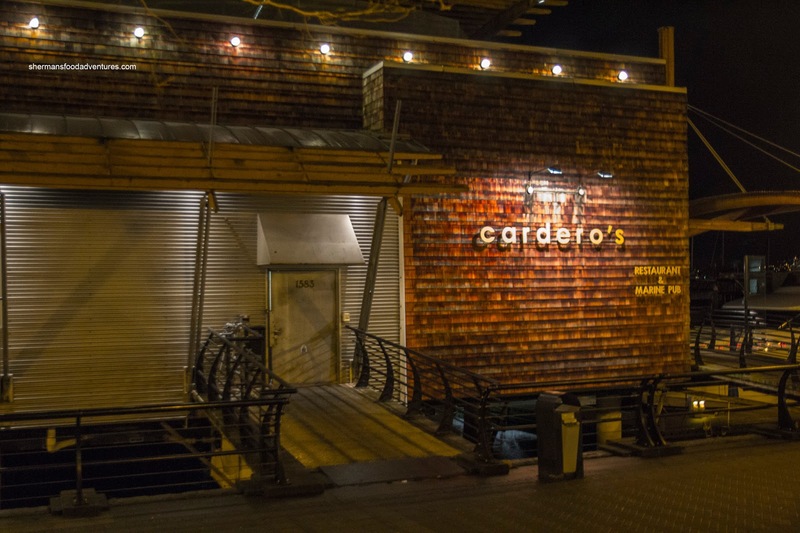 Considering the location, ambiance along with the relatively reasonable prices, Cardero's is an option in the area. That's a LOT of sauce for the lamb shank. Was it au jus or ? @LR It was braising liquid. Too much... and too much sauce in the pasta too!